A week or so ago, Bob Stauffer — the Oilers' radio colour commentator — suggested that Kirk Maltby, working as a Red Wings pro scout, had been at the last two Oilers games. It was at the time Ryan Whitney had been scratched for four of five games and Ian White had recently been scratched for the Red Wings. I love making up fake trades in my head like any other fan so hypothesized about Whitney for White. Both players could use a change of scenery, I hypothesized. Whitney had clearly lost the faith of the coaching staff and his confidence was plummeting on the ice. You could see it in his body language. 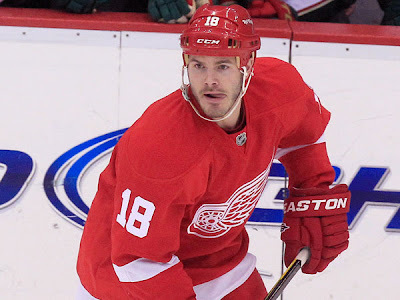 White had clearly come back down to Earth after looking great on Lidstrom's right side at even-strength last year (as Betty White could have if she laced up a pair of skates). So with that, I decided to do another "Shift Stalker" and watched a game vs. the Canucks from February 24th - which was the game that tipped the Babcock scale and cemented his untrustworthy status - along with another game at Minnesota on February 17th in which he played 20:09. I'm not going to really examine his game as closely as I did Weaver's, but I did notice a few things that stood out to me. Maybe the Canucks game wasn't the best indication of the level of play White can bring, but there were some glaring mistakes. It could be chalked up to a bad game, lack of focus, lack of confidence or a variety of other factors but the fact is he didn't play very well at all in defensive coverage. He did flash some positives which show why he's been a sought-after commodity in the league before and why he signed his two-year $5.75M contract. I'll dive into both the positive and negative a little more in the next few paragraphs and clips. Lets start with some positives. White is a pretty small guy, listed at 5-10 and 191 lbs, it's obvious he is bringing some semblance of skills to the table in order to have played in the NHL for seven seasons and counting. In that, White is a decent puck mover—probably above average in comparison to defensemen league-wide. The thing I like with White is he is quite decisive with the puck, he always has his head up, and he's typically looking to make a pass and advance the puck before the alternative of a safe play off the glass or dumping it in. Which is what a lot of bottom-pairing defenders do, and is likely coached into them. His decisiveness and lack of hesitation allows him to be successful in this without making a lot of glaring mistakes in this area. White's puck-moving proclivities are a positive for a team like the Red Wings which implements a philosophy that is extremely possession-based. His head being up is likely also a function of his size and bit of self-preservation. As soon as he gets the puck, or is about to receive it, his head is on a swivel scanning the ice for immediate options. White keeps his feet moving when receiving the puck as well to keep his options open, to pass or skate it up a little to create room for himself. His hard passes and quick and decisive decision-making while possessing the puck combined with his plus skating ability for a defender is his calling card. He's not going to rush the puck up the ice like Erik Karlsson, but his value lies in advancing the puck from the back-end with a primary goal of maintaining possession, which is certainly a skill and scarce resource in the league. The clip shows a few simple plays and decisions he makes that highlights the positive parts of White's game. Now, the contention with White's play most certainly has to do with his defensive coverage. He has a low centre of gravity and compact frame that allows him to stay strong on his skates, but his size is still an impediment as he tries to play physicaly sometimes along with a tendency to become transfixed with the puck. It is to be sure that White can be prone to chasing the puck around the defensive zone and puck-watching. The following two clips are from the game versus the Canucks and two shifts where White gets scored on at 5v5. In clip #1, White gets stuck out against the Sedin line (which I'm sure Babcock tries to avoid), and gets caught watching Henrik in the corner while in the slot at the :10 mark. Burrows floats away into the high slot and White gets visibly hypnotized by the puck as it gets worked down low against his partner Huskins. Burrows finds his way back behind the net to outnumber Huskins and does set an excellent pick on Huskins. White gets stranded in no-mans land in front of the net leaving Huskins succeptible to Burrows' pick. This gives Henrik the split second he needed to break free and find Daniel breaking towards the net from the high slot. In the second clip, White gets outmuscled by the bigger Higgins down low and gets carried around the net by him. White is staying fairly tight and close on Higgins at this point funnelling him towards the boards and keeping stick on stick. After Edler releases a shot attempt towards the goal, White loses his focus in reorienting himself towards the defensive side of the puck and loses his man in Higgins. In this split second, Burrows sets yet another pick behind the net (not called again! ), and Higgins is allowed to drive full speed around the net for a wraparound goal. Lashoff gets caught going to the wrong side of the net in recovery as well. An all-around defensive lapse by the Red Wings unit where multiple people are at fault. Ian White is what he is. Probably a 4 or 5 defender that can move pucks and give you a good effort every night that you can count on. However, due to his style of play and defensive limitations/lack of focus, he is unlikely to be more than that. I certainly think he's better than an option like Corey Potter, but I'd be wary of Detroit's inclination to move him because they have a serious deficiency of right-handed defensemen on their roster. In fact, he's the only one of nine listed defensemen. But White has been moved numerous times at the deadline before and I just wanted to look into what made him valuable. I could certainly see why he performed so strongly last year playing with an excellent player in Lidstrom. White's skills and tools are certainly above average and combined with his puck-moving he would look great beside any number of legitimate LH #1 defensemen like Chara or Suter. That is the type of player that would bring out the best in his skills. Not just anybody can play with these types of players and keep up, it almsot works in both ways because a great all-around defenseman will allow a player like White to play to their strengths without taking much away from their game. Overall, I could certainly see him providing value in the ways I detailed and would be a good fit to fill in your roster on the bottom pairing if not with a legit #1 defensmean. If you wanted, you could put him with a more defensively inclined bottom-pairing option (defensively inclined is not to be confused with solely hitting and fighting). For the Oilers though, there isn't much value there considering where they are now, in my opinion.